All Victoria’s music for Holy Week was published in 1585, towards the end of his stay in Rome, though the exact date of composition of the Lamentations, Responsories and Passions is open to some doubt. Certainly it predates his Officium Hebdomadae Sanctae publication by some years. It means however that these Lamentations pre-date the 1605 Requiem by at least two decades, maybe a quarter of a century. The Lamentations for Maundy Thursday, Good Friday and Holy Saturday are presented in this disc as a sequence, ending with the Maundy Thursday Lamentations of a younger Spanish composer, Juan Gutiérrez de Padilla. As Peter Phillips remarks in his notes most of the music is ‘not properly homophonic’ and its presentation as a direct musical experience was almost certainly Victoria’s intent, rather than a series of discrete episodes. The music has remarkable, indeed at times implacable force and sense of direction. Victoria’s ascending and descending lines, his powerful chording, and harmonic sense, are of hypnotic eloquence and are almost painterly in their effect. The singing is worthy of the music. The Tallis Scholars respond to the textual implications, and to the increase and decrease of choral density with great acumen. The lightness of tone brought to the second lamentation for Good Friday is a case in point whilst the Lament (’They said to their mothers…’) is sung with the highest purity and refinement. In the difficult first Lamentation of the music for Holy Saturday this crack group manages to keep up its pitch even in the most taxing moments. And when its director asks for a greater body of tone they respond admirably. Whilst highly emotive, the Lamentations do not project, or seek to project, quite the same expressive range or depth of the Requiem, but they are seldom the less moving for all that. De Padilla, born in Malaga, active in Cadiz, moved to New Spain (Mexico) in 1622. 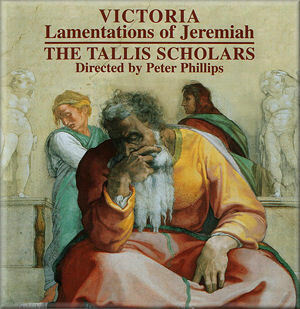 His setting of the Lamentations is a free-flowing, hugely impressive work that has absorbed passionate elements of Iberian writing, and evokes Victoria’s own serious expressivity with consummate control. Full texts are inclined in this almost perfectly recorded disc. In every way it makes a tremendous impression, emotively and sonically. It’s a fitting companion to these forces’ recording of the Responsories and makes a definitive statement about the Lamentations.